The Diocesan Directors of the National Conference of Catholic Charities gather in Peoria, Illinois in September, 1935 for their annual meeting. They had an eventful year to look back on as well as new problems to consider for the future. They had witnessed the passing of a monumental piece of legislation that enacted of some their long-held goals. This triumph, however, was tempered by the on-going difficulties of a nation still struggling to recover from one of the worst economic depressions it had ever seen. John O'Grady, addressing the gathering, spoke of a "spirit of optimism" throughout the country, as people hoped that the Social Security Act would provide real aid and assistance. O'Grady also cautioned, however, that genuine charity for the poor should not be forgotten under improved circumstances. This is a copy of his speech, and reflects the mixed feelings of many proponents of social welfare legislation following the passage of the Social Security Act. What was O'Grady's view of the role of government in caring for the poor? Do you agree with him? Why or why not? 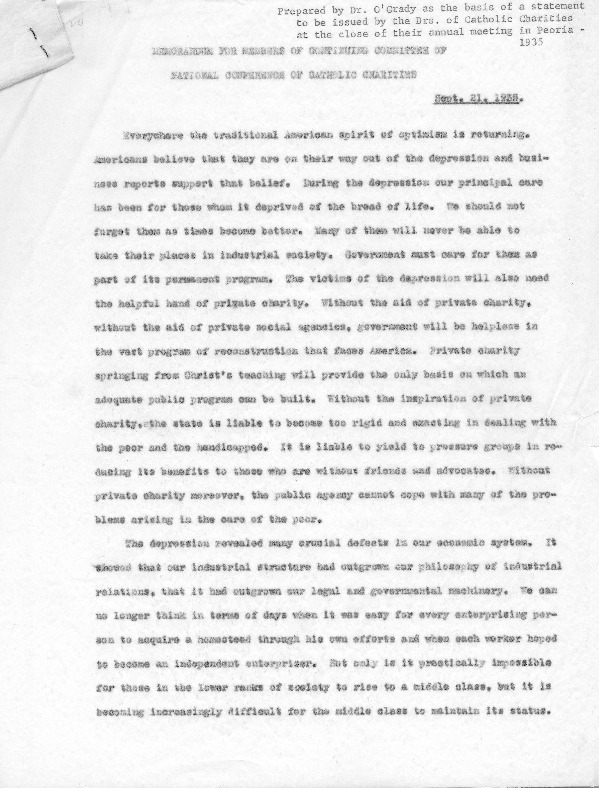 O'Grady described some of the "crucial defects" of our economic system. What are they? Why did he caution against returning to a philosophy of "rugged individualism" once prosperity had returned to the nation? What was O'Grady's opinion of the Social Security Act? What other programs did he suggest that government should enact? According to O'Grady, what is the role of the Church in the economic and social life of the nation? ← "Summary of Provisions of the Social Security Act Relating to Federal Grants to States," August 14, 1935.